STAY CONNECTED - listen to Music, answer Phone calls. "Daluna is the first Australian manufacturer/brand to introduce Apple MFi certified Connected Wear - Wearable Technology into Australia." Leave your mobile device in your pocket as you navigate across with a keypad or Joystick applied to the sleeve of your garment. Listen through a built-in corded earphone. 100% waterproof. Available exclusively from Daluna. BE SEEN & BE SAFE - at night with Reflective and Glow in the Dark Safety Accents! These features have been strategically placed to compliment each style so today's senior students can feel safe and still look stylish. Application options include Screen printing, Vinyl transfer, Sew on strip/piping. Based on your feedback Daluna has added the "Detachable Hood" to satisfy school regulation and student wish. Customised in your choice of lining colour and finish. Lined with either mesh or jersey fabric in your colour. ALL ABOUT THE INSIDE - The Most Popular Feature to Express Yourself. 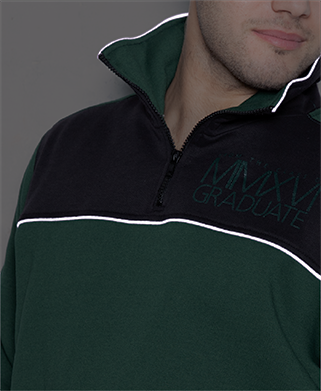 Decorate the inside lining of your jacket with a fun group shot or have the class name list added. Comply with school rules as it is hidden for only you to see/enjoy. This will turn your commemorative piece into something you treasure and look back on in years to come.